Sure, being a grandparent is fun – in some ways, more fun than being a parent. But it also is serious business. 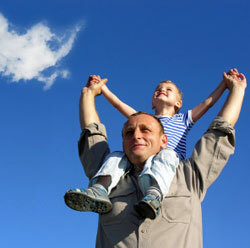 Experts agree that a strong relationship with grandparents provides significant benefits to children. Perhaps most importantly, grandparents are a source of unconditional love. Knowing they are loved no matter what can help children have the courage to stretch their wings and try new things. It makes them feel safe and feel good about themselves. Parents provide unconditional love, too, of course. But grandparents may be less judgmental or restrictive than parents, mainly because they are old enough to realize the importance of not sweating the small stuff. In addition, they don’t usually have to deal with children on a daily basis, so things like messy rooms are not nearly as annoying to them. Even grandparents who provide child care for their grandchildren usually get to go home at night. Grandparents also often have more time than parents do -- more time to play a game or take a walk or listen to a story. They are less likely to be struggling to build a career, and they don’t usually have to worry about full-time care of the children. Grandparents are a link between generations. They can talk to their grandchildren about what the children’s parents were like as kids, and they can also talk about what their lives were like when they were young. They provide a living, breathing, loving glimpse into history, both general and the child’s personal history and traditions. They also allow children to see the effects of aging and help them to understand the realities of all stages of life. They often provide children with a sounding board other than their parents. Because of their life experience, grandparents have a different perspective than parents have, and children can benefit from that perspective. So if you are lucky enough to be a grandparent – or a grandaunt or granduncle or family friend to children -- how can you foster a deeper relationship with your grandchildren? Most importantly, be present in their lives. If you live nearby, see them regularly. Go to their school events, take them to the movies or out to dinner. If you have multiple grandchildren, try to plan special times for each of them alone. If you live far away, you can still be part of their lives. Visit them as often as you can, and if you can’t be there in person, call them or Skype with them. Keep track of important events in their lives, and call with encouragement beforehand or to catch up afterward. As they get older, invite them to come visit you. Focus on them when you are together. Whether you are taking a walk or playing a game, talk to them, and allow them to talk to you. Be interested in the things that interest them. Share with them your favorite books, for example, or have a catch with them. Be alert. Sometimes grandparents notice things that parents do not. If you see something that bothers you, talk to the child’s parent about it. If the child is old enough, talk to the child. It is important for children to know that people are looking out for them. Finally, remember that you are the grandparent, not the parent. Let your children know when you think they are doing a good job of parenting, and don’t expect them to do everything the way you did. Don’t undercut the authority of the parents, and don’t let your grandchild use you to drive a wedge between his or her parents or to undermine their rules. Instead, enjoy the opportunity to be a grandparent.